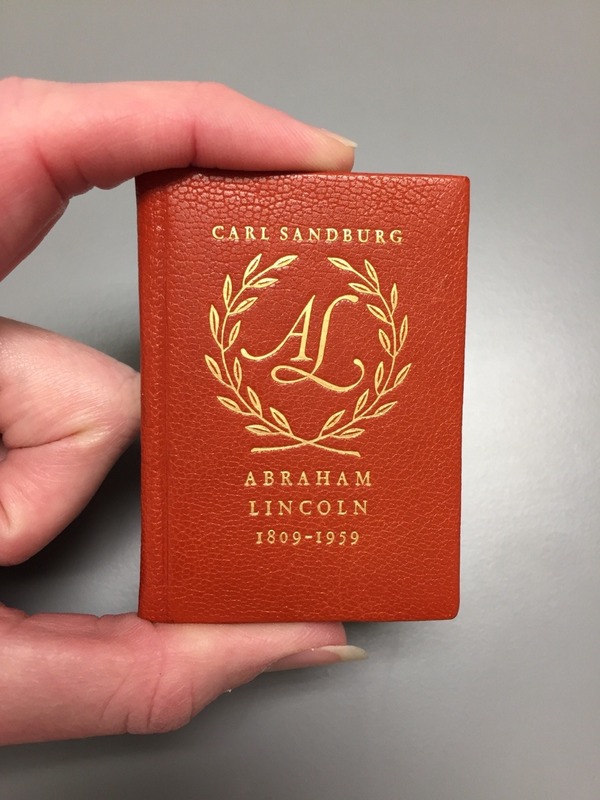 This miniature edition of Carl Sandburg’s 1959 address to Congress, celebrating the 100 year anniversary of Abraham Lincoln’s inauguration is only 6.6 centimeters high. 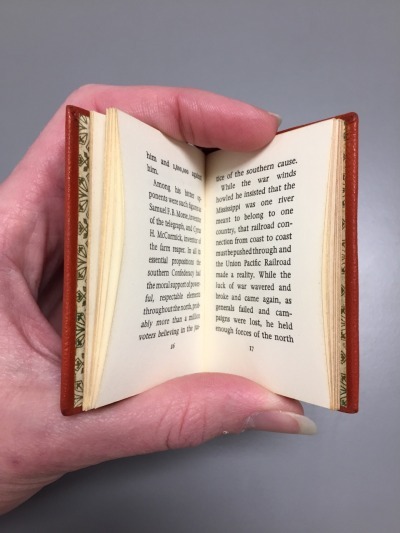 A book this small can easily get lost on library shelves, so a special enclosure was made. 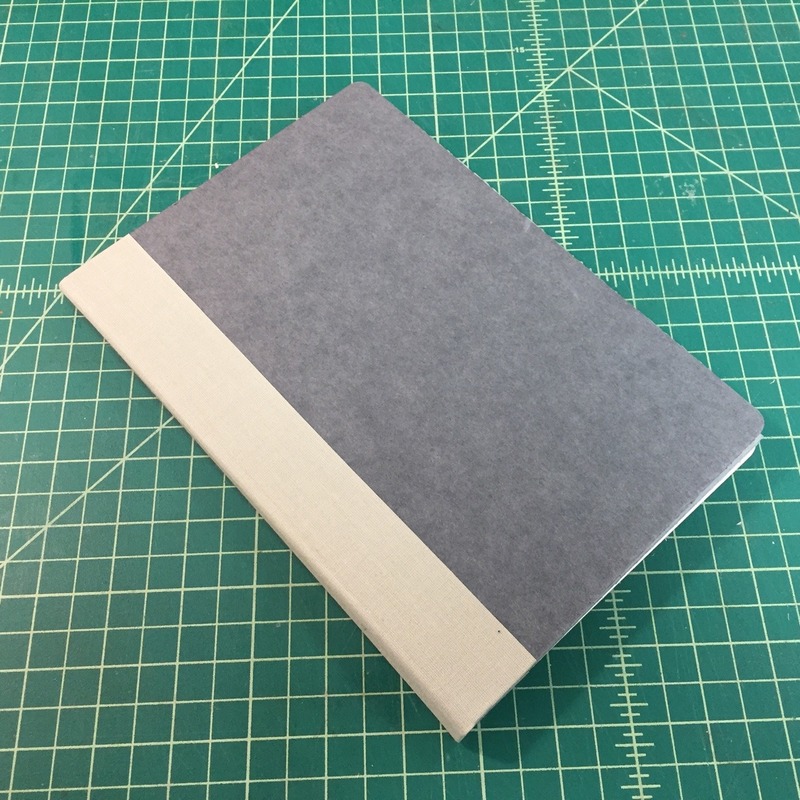 The book is housed inside a custom four flap wrapper, which sits inside a larger cover. The inside is padded out with corrugated board to keep the tiny book from moving around inside. This little sweetie – one of only 2000 made – can now be stored safely on our library shelves! Before migrating to Michigan and beginning work at the MSU Libraries Wallace Conservation Lab, Bexx Caswell-Olson was employed as a bookbinder and book conservator in private practice in Iowa City, IA. Prior to running her own business, Bexx spent nearly a decade living in the Boston area where she worked in a variety of libraries and conservation labs, including those at Harvard and MIT. 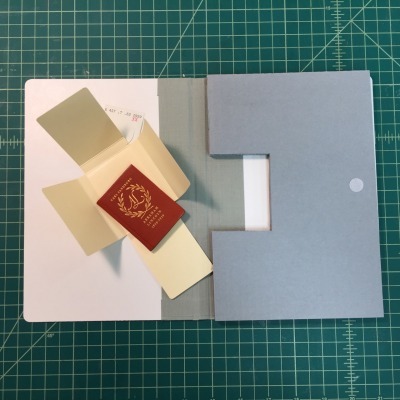 She is Vice President of the Guild of Book Workers, a national organization for those working in bookbinding, book conservation, and the book arts. Bexx holds a Certificate in Bookbinding from the North Bennet Street School and a Master’s of Library Science from Simmons College. In addition to her passion for bookbinding, Bexx also has an affinity for typography, bibliomysteries, seed bead weaving, and vegan baking.